Please call and email the Legislators in your area between now and the end of this week! There are only two weeks left before they have to pass the budget (April 1). PLEASE THANK HIM/HER for supporting language in the one-house budget bill to stagger the school building condition survey. The next building condition survey is scheduled for next year – if we do not stagger the surveys now, we will have missed our opportunity to reduce the State Education Department's backlog and costs associated with capital projects. PLEASE ASK HIM/HER to support the proposal so it is included in the enacted budget. 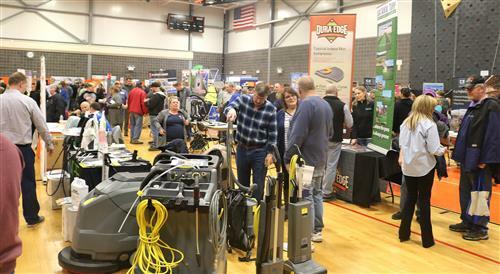 A presentation about initial actions in an emergency and a show-record 50 trade-related vendors packing a Mexico gymnasium highlighted the recent 24th annual School Facilities Professional Development Seminar and Trade Show. More than 200 O&M staff members from districts around the county heard from local school safety and security institution Armoured One about best practices in case of an emergency plus another presentation about the New York State employee’s retirement system. Show a warm welcome to our new members from February by sending them an email. State lawmakers from the region made their latest attempts last week to spare the Newburgh, Chester and Roscoe school districts more than $17 million in combined fines the state imposed because they allegedly failed to file final reports on building projects they completed years ago. Budget proposals introduced by the Senate and Assembly to frame negotiations with Gov. Andrew Cuomo over the next two weeks would absolve those districts and others in New York by dropping what lawmakers call draconian penalties for paperwork errors. The final budget, due by April 1, will likely determine if the districts must repay state aid they got for that construction or fight the penalties in court. Newburgh already has returned $5 million and would have to repay another $12.5 million in installments over the next five years, Assemblyman Jonathan Jacobson, a City of Newburgh Democrat, said Thursday. Jacobson said he was confident the final budget will waive that penalty. However, the Legislature’s proposals would not return the $5 million Newburgh has already paid. Lake George Central School District has received the results of a comparative study that school officials say will help them maintain opportunities for students in a time of declining enrollment. The results found that Lake George offers more programs, clubs and activities than most other schools its size and has very high achievement scores compared to state averages. The study also found Lake George’s enrollment is expected to continue to decline for another five years before eventually leveling off after an approximately 23 percent drop. Lake George Central School District Superintendent Lynne Rutnik said in an email she was not surprised by the findings, and the purpose of the study was aimed at gathering data that can help the district maintain its high standards. “If we are to continue our efforts that support excellence, innovation, and personalization, we needed to have the facts in order to engage in meaningful and informed discussions,” Rutnik said. A new proposed capital project for Salmon River Central School District would see renovations to the middle school and high school classrooms, upgrades to the building’s elevators and improvements at the school arena. The district is planning to hold an informational public forum on the proposed $26.5 million capital project on April 1. The proposed project was approved by the school board last month and will be put to district voters for final approval on May 21, along with the regular budget vote. Other major goals include upgrading the high school and middle school elevators, constructing a new salt storage shed, improving movement flow in the cafeteria and several renovations to the school arena. Four-Day School Weeks Catching On Across U.S. The move is expected to cut costs, as Avoyelles Parish superintendent Blaine Dauzat told Yahoo News that “we are dead last in the state in teachers’ salaries,” as well as help hire and retain teachers who would still be paid five-day salaries while working for four days, albeit by extending the length they teach during the days that they’re on.